It looks like we dodged a bullet last night when it comes to the weather. After weeks of very mild weather, winter came roaring back. Temperatures were forecasted to dip to 26 for 12+ hours, but thankfully a layer of high thin clouds moved over us, so it was only 29 degrees for our low and freezing temps for about 5 hours. 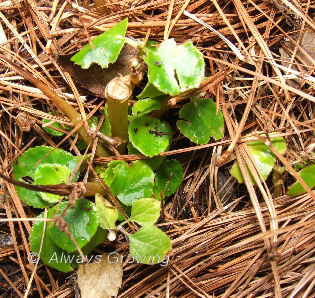 Not enough cold weather to do any harm to tender new growth that has started showing up. All of the daylilies have started showing new growth, and as I was protecting other tender tropical plants, I was keeping my fingers crossed hoping this new growth wouldn’t be harmed by the freeze. 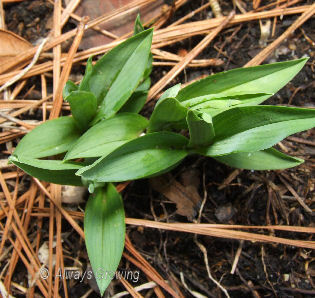 After it warmed up, I went to check on things, and all the daylilies were fine – the newly emerging ones as well as the evergreen ones that have new growth. I had just been speculating that I would not have to purchase any wax begonia this spring because last year’s was still hanging on. I thought that I had spoken too soon, but, no, all seems to have come through fine. All the new leaves are fine, so it look as if I just may be able to spend money on other plants instead of on new begonias. Other plants that have started putting out new foliage and made it through just fine are holly ferns, cry baby tree, salvias, and even my returning coleus plant. Thank goodness for the microclimates in my garden that help so many plants make it through cold weather. 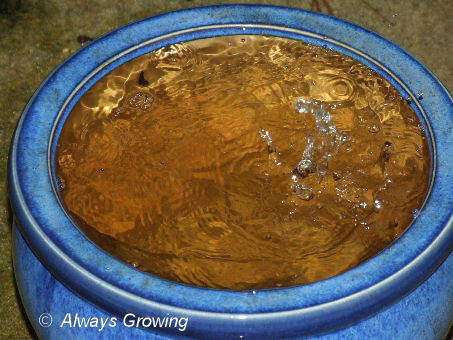 When we started having warmer weather in early January, in the back of my mind was always the scenario of a hard freeze coming after tender new growth or flowers showed up. This has happened in the past, and it is so frustrating that tender plants that made it all through the winter succumb at the last minute. Last night I was pretty worried about all this new growth, but today it looks like everything will be fine. Big sigh of relief. It has been a La Nina winter. Here in the South, that means warmer temperatures and dry conditions. So far, we have had consistently chilly/cold weather with little to no rain. Even though we have not had the moisture, we have had the clouds dominate every time a cold front comes through. Days of grey skies. After even a few days with little or no sunshine, blue skies are a welcome sight, and they finally have shown up. Blue skies means sunshine for plants to grow and bloom, warmer temperatures for working out in the garden, and bright light which always lifts the spirits. 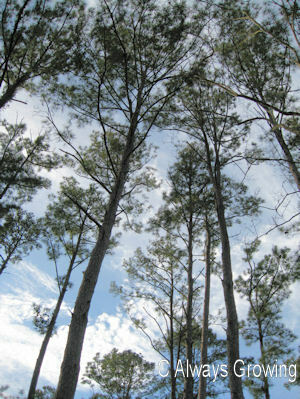 Looking forward to more blue skies in 2012. Whenever a storm moves through, everyone tends to concentrate on the devastation, but often there are some benefits. We averted the forecasted deluge that was supposed to come from Tropical Storm Lee. We only had about nine inches of rain which was a lot, but it was needed. That nine inches of rain is more than fell in all of April, May, June, July, and August. Normally, we would have received over twenty inches total for those months. All the plants have appreciated the moisture and have perked up. In fact, the hydrangeas that I cut back two weeks ago have put out new growth. Thank goodness our first freeze date is months away. After Lee left, we have had absolutely gorgeous weather – breezy and cool. Lows in the 50’s at night, and highs in the 70’s. We hardly ever get weather like this in early September, much less after a tropical system moves through. Normally, after a hurricane or tropical storm the weather is still, hot, and humid. The moisture we had this weekend was really needed. 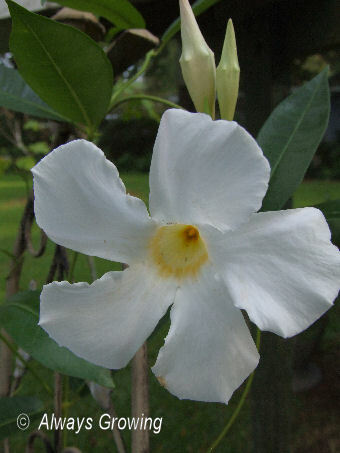 One plant that has done better with all the rain is my white mandevilla vine. My mother rooted this for me about three years ago, and every fall I dig it up and overwinter it in a smaller container. With the drought and extreme heat of this summer, it just didn’t bloom. Now, a few flowers have shown up, and there are buds all over. It is amazing how plants that have been so dry respond so well to rain. 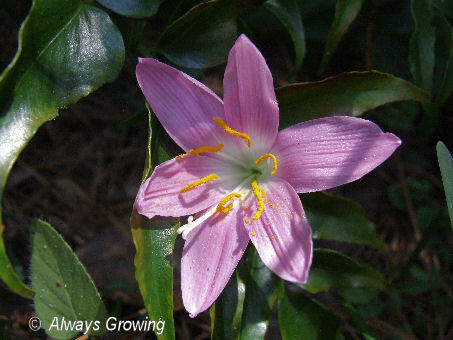 Now that southeastern Louisiana has moved from extreme drought to moderate drought, maybe more plants will start blooming. Looks like this long Labor Day weekend should bring an end to our drought with tropical weather forecasted to cover the Gulf Coast. The weather center is predicting that we could get up to 15 to 20 inches of rain over the next three days. Of course, I would like the rain, but not that much. It seems it is either feast or famine when it comes to rain around here. I’m just hoping my garden doesn’t float away. Ten inches short on rain in 2010 and twelve inches short on rain so far for 2011 puts us in the extreme dry category. The drought is not over here, but it does seem to be abating. After less than two inches of rain for the months of April, May, and June, we have started to return to a normal pattern of rain showers. Halleluiah! The rain started on July 15th and hasn’t stopped. Now, I will admit that a few of those days had only a tiny amount of rain, but it was enough to keep the ground from drying out. For forty days ’twill rain nae mair. One very nice thing about this rain is the showing up of the Rain lilies. I discovered one yesterday and was so surprised to see it. They have not bloomed in such a long time that I forgot I had them in the garden. Since they need a soaking rain to start blooming and we haven’t had one of those in months, it is no wonder they haven’t bloomed before now. It is just about this time every year that I start to get cabin fever. I know cabin fever is associated more with winter, but here, during the hottest part of the summer, is when I get it. We have been having heat advisories or rain for the last five days. Today, we had both! Heat in the morning, rain in the afternoon. So, all this means is that, except for a few short forays into the garden very early in the morning just to look around, I spend my days indoors. 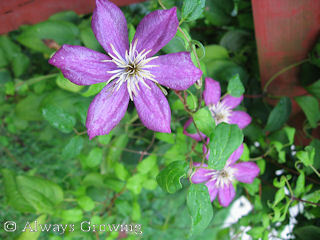 Thanks goodness for flowers like this clematis; it certainly looks cool in the midst of summer’s heat. I can’t wait for a little cooler weather so I can be outside again in the garden. There is still so much to do. There’s supposed to be a high chance of rain tomorrow, but I am hoping to get out and cut back the coleus plants and root some more cuttings. With this heat, that is about all I am able to do. At least I haven’t had to water anything in several days. Funny, how we complained about all the cold weather this past winter, and now, it is the heat which has us wishing for autumn’s cooler temps. Thank goodness, Tropical Storm Bonnie’s no problem for the Gulf Coast. We have been watching the weather forecasts about the latest tropical storm for the last few days and are so glad that Bonnie has proved to be nothing more than a rain event by the time it will get to us. I don’t mind that I picked up so many garden things in preparation for a storm that turned out to be nothing, and I am very glad that we won’t be picking up storm debris. Even though they shut down the oil cleanup yesterday because of the forecast, some boats were already back out this afternoon skimming the oil. The winds also seemed to help push the oil from the coast. Mother Nature didn’t pay any attention to the predictions of a storm. 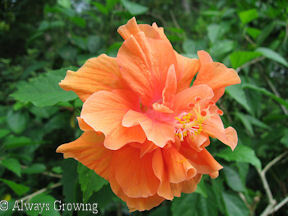 Here is a lovely hibiscus that opened up with no worry about being rained upon. I’d rather look at this than hard rain and high winds, wouldn’t you? Today marked the third day in a row that we had sunny, blue skies, something we haven’t seen around here a long time. It is amazing to me how even though it was too cold and windy to be outside for any length of time, just having the sun out and shining through the windows into the house raised everyone’s spirits, even the cat’s. 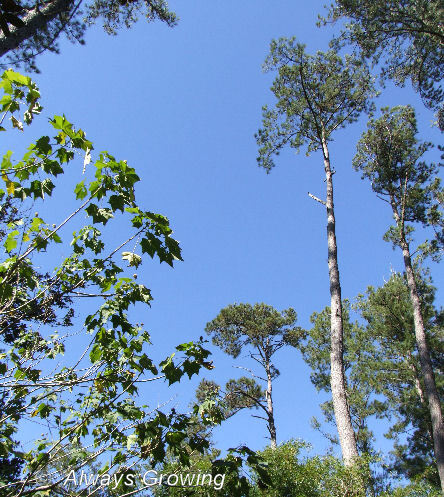 Seeing blue sky through the pine trees after all the recent gray days was certainly a treat. 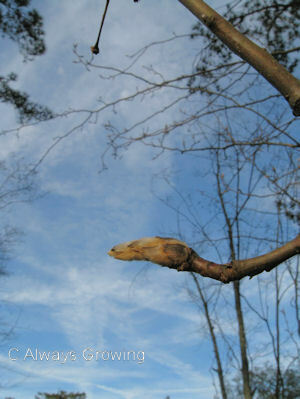 The above is a picture of this afternoon’s blue skies and a Bradford pear flower bud. After I downloaded the photo, I couldn’t believe that bud. Doesn’t it look like a camel’s head? Dreary, dreary, dreary. That has been our weather lately. 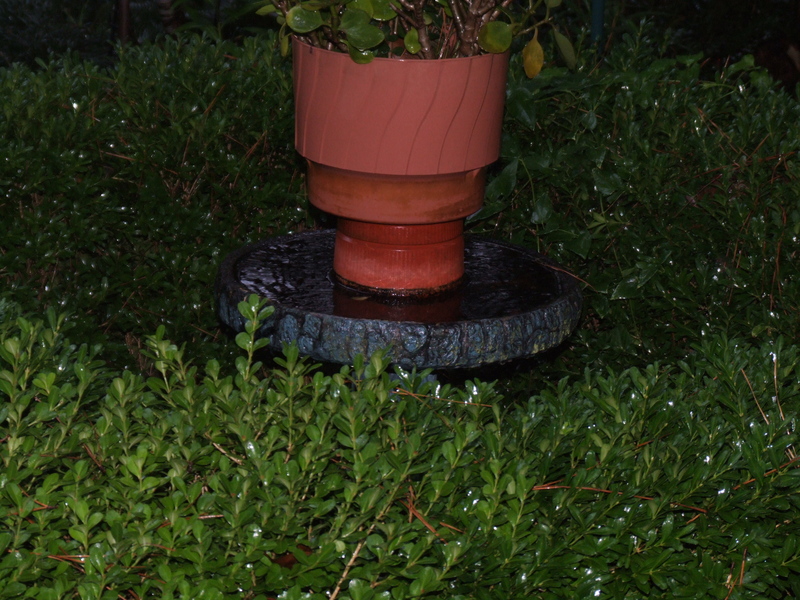 It has been rainy, damp, cold, and gray it seems for weeks now. It has been lightly raining for over 24 hours now. Yesterday, there was some frozen rain falling on the car as I drove home, and today it is supposed to be a wintry mix, but so far it is just rain. I was a little concerned last night about the weather since sleet and/or snow was predicted to start around midnight, and I have to leave for work about 6:15 AM. Don’t like driving on icy streets. But, so far it looks like that hasn’t happened. Mardi Gras vacation starts today, and I will have three days off next week. Usually, this is the time to do a lot of gardening, but this year, it seems, it will be cold and damp. Too cold to do much in the way of gardening which is so disappointing. I know so many people have it much worse than we do (poor Northeast), and I don’t know how they are getting through this winter. I just want one week of sun and cool (not cold) temperatures. Is that too much to ask for? I always used to think that winter darkness lasted too long until I started gardening and started paying more attention to nature. Now, I notice that just after Christmas, it doesn’t get as dark as early as it did in mid-December, and now, in early February, already the sun is showing when I leave for work at 6:15 AM. This certainly is one more subtle sign that spring is coming. If you see ads, they are NOT mine. They are inserted by WordPress.